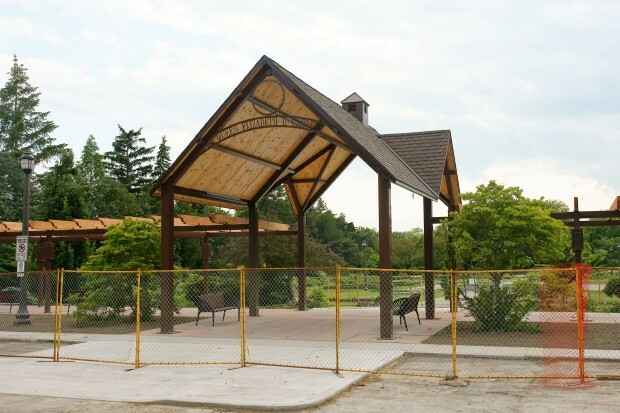 Construction of the new trellis in Jackson Park is almost complete, and is the last in this phase redevelopment, as part of the master plan for the park. Other improvements included a walking path that winds its way thought the park and under Ouellette Avenue connecting the two sections of the park once again. Decorative lighting was also added through the park making it enjoyable in the evening hours, and drainage was improved in sections of the park that were prone to flooding. The original budget for this project was $800,000, funded through the Recreation Infrastructure Canada Initiatives. On November 15 a report went to council requesting an additional $300,314.68 for the construction of the new trellis. Now that the project is almost wrapped up, are report is heading to council requesting an additional $97,680. This money is requested to cover some additional costs not planned for. This includes additional lighting under the Ouellette Underpass, additional storm drainage and repairs to the driveway. The grand total for the redevelopment of Jackson Park came in at $1,197,995 a difference of $397,995 of the original budget. The budget short fall will be funded with the 5 year capital contingency that council has set up to cover project short falls.